The first reviews for Star Wars: The Last Jedi are in and, with the exception of a few naysayers, the reaction has been mostly positive. Currently, Rian Johnson’s sequel has a 93% rating on Rotten Tomatoes, matching the rating of 2015’s The Force Awakens. 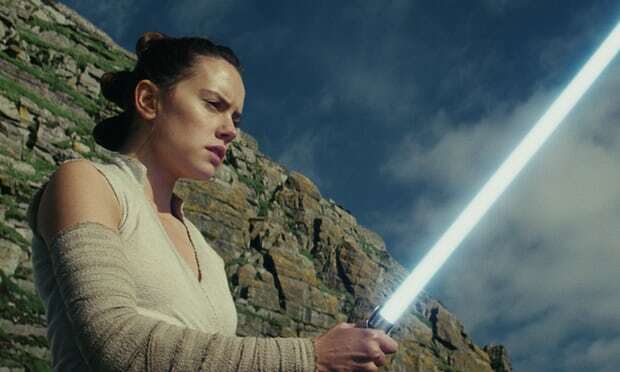 On rival reviews aggregation site Metacritic, The Last Jedi has bested its predecessor with a rating of 85 to the Force Awakens’ 81. This latest, and longest, franchise entry has the decided feel of a passing of the torch from one set of characters, and actors, to the next. Loaded with action and satisfying in the ways its loyal audience wants it to be, writer-director Rian Johnson’s plunge into George Lucas’s universe is generally pleasing even as it sometimes strains to find useful and/or interesting things for some of its characters to do. Although The Last Jedi meets a relatively high standard for franchise film-making, Johnson’s effort is ultimately a disappointment. If anything, it demonstrates just how effective supervising producer Kathleen Kennedy and the forces that oversee this now Disney-owned property are at moulding their individual directors’ visions into supporting a unified corporate aesthetic … But Johnson was either strong enough or weak enough to adapt to such pressures, and the result is the longest and least essential chapter in the series. Rian Johnson’s film certainly feels like Star Wars: it even has a supporting cast made up of British character actors and gorgeously CG-augmented rubber creatures, including porgs, a kind of hyper-marketable cross between a puffin and a young Justin Bieber. But it’s not a Star Wars you’re entirely sure Lucas would or could have ever made himself. Rather than playing the hits, as JJ Abrams’s franchise-reviving The Force Awakens did two Christmases ago, it flexes its fingers before riffing over old chord progressions in ways that will leave fans beaming with surprise. If it’s better, and more satisfying, than the original instalments, this is often because it talks to them so freely (and not entirely without criticism). Scenes echo scenes. Shots deliberately rhyme (look for a reference to the lift sequence with Luke Skywalker and Darth Vader in Return of the Jedi). Musical cues nod and wink, until the film becomes dense and layered and bubbling with ideas and feelings, a whip-smart Star Wars smorgasbord that will also make you cry. Superbly played by Adam Driver … [Ren] is now a wounded, damaged figure, and he insinuates himself like a sensually predatory Satan into our consciousness in a series of dreamlike cross-cutting dialogue sequences that are the most successful part of the film. What does Kylo Ren want? As ever, the closeups on Driver’s face are gorgeous. He is never the Easter Island statue of hardness that it is possible to misremember. He is tremulous, unsure of himself, like an unhappy teenager, and his mouth seems almost on the point of trembling with tears. That breathy, resonant voice is unmistakable even from behind a neo-Vader mask. Mr Johnson has picked up the baton that was handed to Mr Abrams when he signed on to revive the series with The Force Awakens. Mr Johnson doesn’t have to make the important introductions; for the most part, the principals were in place, as was an overarching mythology that during some arid periods has seemed more sustained by fan faith than anything else. Even so, he has to convince you that these searching, burgeoning heroes and villains fit together emotionally, not simply on a Lucasfilm whiteboard, and that they have the requisite lightness and heaviness, the ineffable spirit and grandeur to reinvigorate a pop-cultural juggernaut. That he’s made a good movie in doing so isn’t icing; it’s the whole cake.